Perfect gift for your godchild for his/her baptism, baby dedication, christening, or even as a newborn gift. 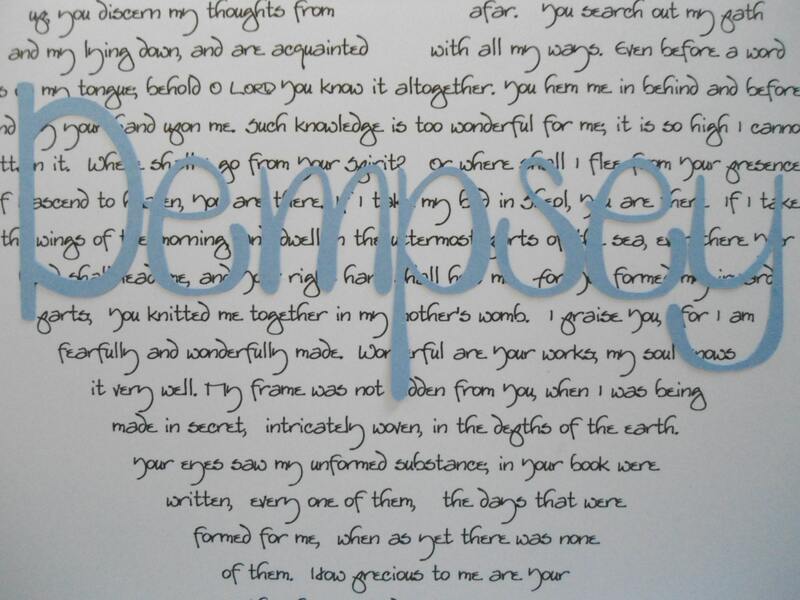 This popular customized baby print is one of our very popular ORIGINAL designs. 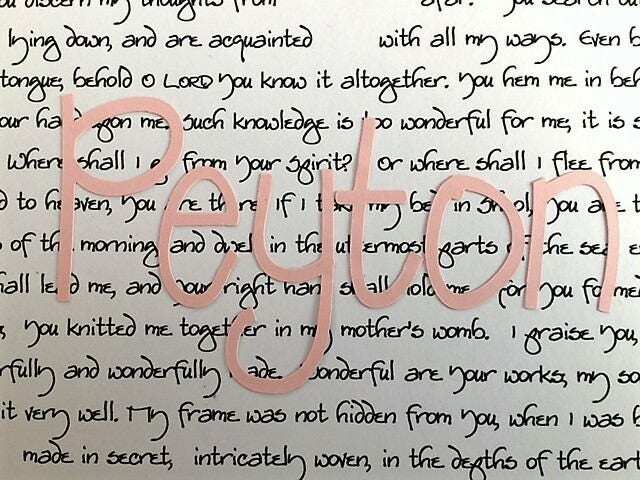 This print will have the child's name (first name only) cut out in pink (for girls) and blue (for boys) in an overlay over the scripture, Psalm 139, which I've custom designed in the shape of a heart. 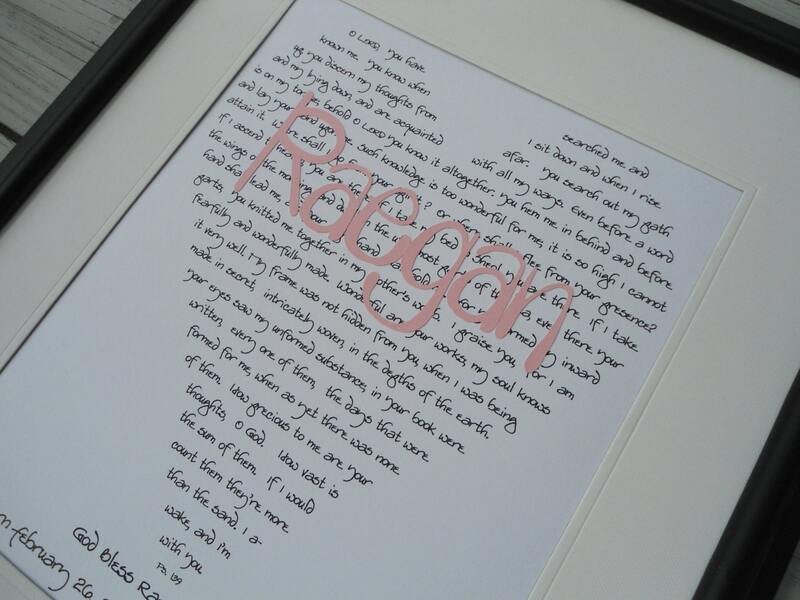 Your print will still have the child's name, birth date and/or baptism/dedication/christening date at the bottom as well if you wish to add 2-3 lines at the bottom. This baby christening or baptism or baby dedication 8 x 10 print is our exclusive design~I made the first one for my friend's baby's baptism. 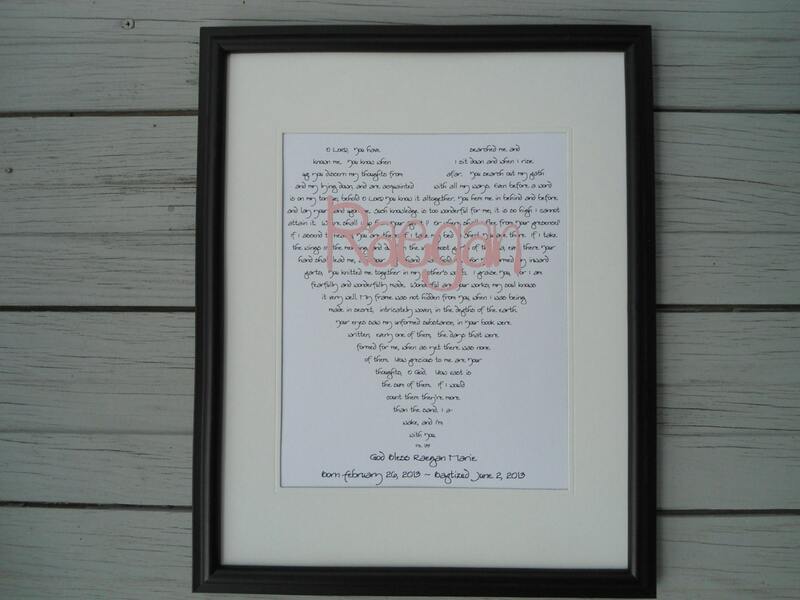 This custom design portrays the words of Psalm 139 ("I am fearfully and wonderfully made") in the shape of a heart I designed, with the child's name and baptism/christening/dedication date at the bottom. This would also be a great gift anyone who is a parent, grandparent, or godparent. This design makes a perfect gift for the religious ceremony you've been invited to,even if you don't know the child being baptized very well...he or she will have a heirloom handmade gift to cherish. This looks stunning in a black 8 x 10 frame. Or you could use a black or another color mat, and even frame it in a larger 11 x 14 frame with an 11 x 14 matte with an 8 x 10 opening in the matte. THIS listing is for Ps. 139 as shown in photos. 4. anything else you want included as long as it fits with the other text at the bottom: in this example I used the location of the baptism, as the church is special to the parents. Your print will be ready to ship within 3 weeks, but order earlier during peak seasons...during peak times the turn around time may be up to 3 weeks or more. Your custom print will be on heavy white 8" x 10" 110# premium cardstock, printed in my signature font, carefully tucked inside a cello bag, in a rigid mailer shipped priority mail, arriving within approximately 3 business days after I ship in the continental US. I complete custom orders in the order in which they are purchased. So, please remember to allow at least 7-10 business days, from the time I receive your information, counting making your order before shipping it. I can upgrade your shipping to a rush order if you contact me and if you wish to pay more to get it there sooner. 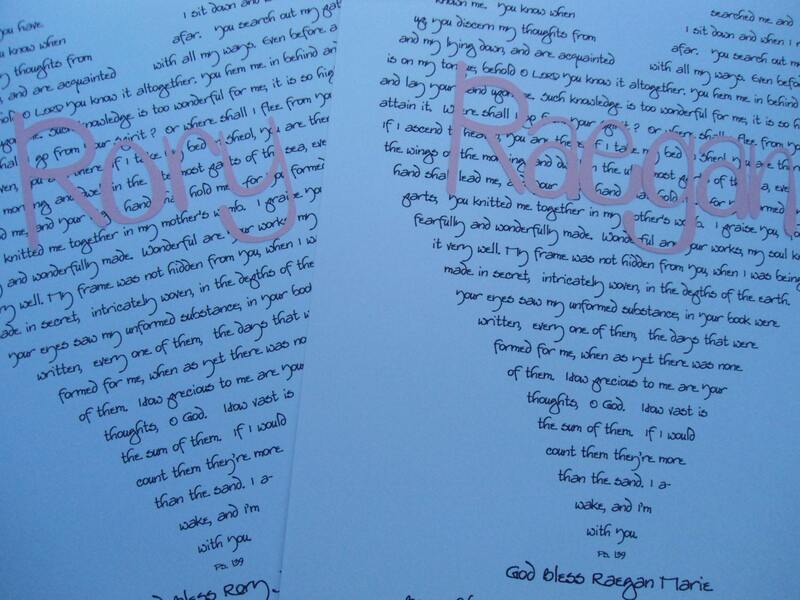 NOTE: This is an exclusive riricreations design (including all of my 5 x 7 and 8 x 10 prints with customized words around the central image, and the LOVE print, and Psalm 139 print, I carry your heart print, and my "dad", and "mom" designs. You may not copy or reproduce this design without my permission. Please respect my original designs. I love it. Will make a very nice gift. Turned out perfect!! Their parents loved the gifts and can't wait to hang in their babies rooms! Thank you so much. Had a chance to speak with Rita by phone. So kind and helpful! Thanks again!!! This is our second purchase for our girls dedication. LOVE IT!! This is such a beautiful memory our girls will have forever. It's one of a kind and symbolizes our dedication as parents to teach and model what it is to love and follow Jesus!! !